Many things can happen to your children’s beds, and these include inevitable stains caused by sweat, spilled food or beverages, and bedwetting. An organic wool mattress protector can serve as an additional layer of protection that will prevent the actual mattress from becoming permanently stained. Organic wool is an environmentally friendly, child-safe, and sustainable material that offers a comfortable sleep surface while acting as a natural insulator that will keep your kids warm in the winter and cool in the summer. Wool is absorbent and helps regulate body temperature, even when the air is damp or humid. Organic wool provides a luxurious feel, while ensuring a lighter weight that will not cause any discomfort when placed over an organic mattress. In fact, it will help alleviate pressure, too, so your kids can sleep comfortably and wake up without feeling sore. The material has air spaces between every fiber to cushion the body and support the spine. An organic wool mattress protector can beneficial to your kids’ health, too. Because it protects the mattress from moisture, it helps prevent mold, mildew, fungus, and bacteria from thriving and causing health issues and skin or respiratory allergies. Natural wool is not washed, cleaned, or treated with harmful cleansers, bleach, pesticides, and flame retardants, so, it still has lanolin, which naturally repels dust mites. Hence, your kids can sleep soundly without worrying about bugs biting them. Believe it or not, organic wool is actually hypoallergenic. Wool-related allergies are actually related to the toxic chemicals present in conventional wool. Natural wool is naturally flame retardant, too. 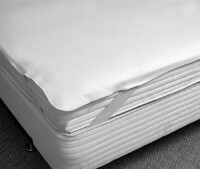 In case the organic mattress protector catches fire, the flames will not easily spread, and you can easily put it out. Synthetic materials tend to be treated with harmful chemicals to enhance their flame resistance, and these substances can increase your children’s risk of developing certain types of cancers, neurological and developmental disorders, and reproductive problems later in life.